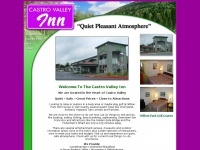 The Castro Valley Inn is the premiere Inn in Castro Valley for budget conscience travelers. Located in the heart of Castro Valley, the Inn offers weary travelers, clean rooms, comfortable accommodations and low prices in a convenient and safe location. The web server with the IP-address 184.168.164.1 used by Castrovalleyinn.net is owned by GoDaddy.com, LLC and is located in Scottsdale, USA. There are many websites run by this web server. The operator uses this server for many hosting clients. In total there are at least 291 websites on this server. The language of these websites is mostly english. The websites of Castrovalleyinn.net are served by a Apache server. The markup language of the website is XHTML 1.0 Transitional. The visitor analysis software Google Analytics is used to analyze the visitors of the websites. The website does not specify details about the inclusion of its content in search engines. For this reason the content will be included by search engines.